The organizers of the 11th edition of the DISCOP AFRICA television industry gathering to be held at the SANDTON CONVENTION CENTER from 4 to 6 November, have unveiled MEET YOUR STARS, a sidebar event showcasing new series and marquee shows and to run parallel to the 3-day market and co-production forum. 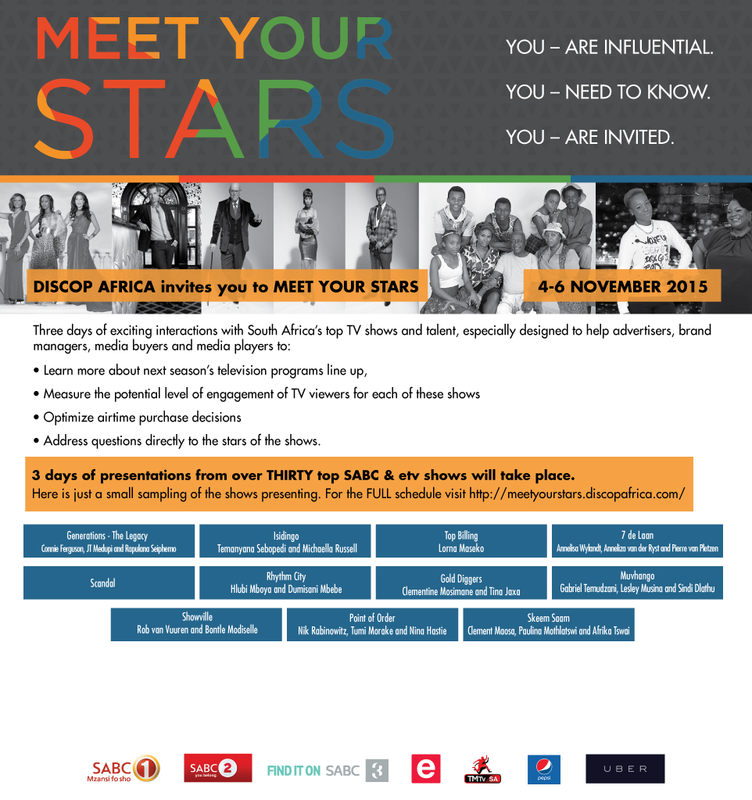 MEET YOUR STARS will enable media buyers, advertisers, brand managers and influential leaders in the industry to be the first to hear - in advance of South Africa’s next television season – all the information on new and returning hit-shows as well directly from talent attached to each of them. MEET YOUR STARS will run parallel to the 11th edition of the DISCOP AFRICA television industry gathering to be held at the SANDTON CONVENTION CENTER from 4 to 6 November, an event exepcted to draw 1,500+ delegates and 250+ exhibitors from 90+ countries driving television content business and distribution across Africa. Qualified executives will be invited to participate in the MEET YOUR STARS program, free of charge, and also attend other DISCOP AFRICA highlights to include conferences, workshops, matchmaking sessions and numerous networking functions. Follow them on twitter & facebook & Instagram.